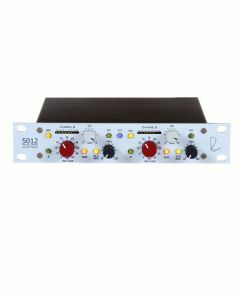 The Portico 5012 is a dual channel mic pre featuring Neve’s custom input and output transformer designs. In addition to individually selectable phase, mute, phantom power and a fully sweepable high pass filter, the 5012 incorporates a “Silk” circuit which yields the rich warmth and presence of the renowned classic designs. The High pass filter is a valuable aid in any signal chain but particularly so in a microphone preamplifier. Signals between 20 and 250 Hz can be attenuated, leaving the range above this unaffected. This gets rid of building rumble, air handling motor hum etc. The To Buss output is unbalanced and has a high impedance output. It is intended for use with the Portico Buss Amp/Monitoring modules. A TRS patch cord is used to connect the 5012 Buss output to one of these bussing modules. The Monitor connection is derived pre mute on the 5012 and will produce a signal at the output of the buss modules that is equal in level to that at the 5012 output. The Monitor output cannot be used for any other purpose. Balanced, using “Transformer-Like-Amplifier” (T.L.A.) with toroidal Common Mode Rejection Low Pass Filter that excludes frequencies above 150 kHz. The T.L.A. is followed by an actual input transformer permitting a full +26 dBu input signal to be handled at unity gain without an input pad over the whole audio spectrum. Combines the advantages of both an “Electronically Balanced” and true Transformer input. When the Phantom voltage is disabled, this input serves as a very high quality Line Input. Measured at Main Output: Input terminated with 150 Ohms. Swept Frequency continuously variable from 20 Hz to 250 Hz. Slope: 12 dB/Octave. Gain: Switched Gain from Unity to +66dB in 6 dB steps. Trim: Continuously adjustable potentiometer from 6dB to +6dB with reference to setting on the Gain Switch. Main Output: @ 20Hz, +20 dBu output level, no load: Better than 0.01%. Buss Output: @ 1kHz, +20 dBu output level, no load, measured at the output: Better than 0.002%. SILK: The 5012 uses mainly single-sided amplifier circuitry that excludes any possibility of crossover distortion. The “SILK” button reduces negative feedback and adjusts the frequency spectrum to provide a very sweet and musical performance. Buss Output: The Buss Output is designed to feed other Portico Series modules with Buss Inputs. Main Power Required: (From External Power Unit) Voltage Range, 9 to 18 Volts DC.